The First change you can observe in latest version is user interface. 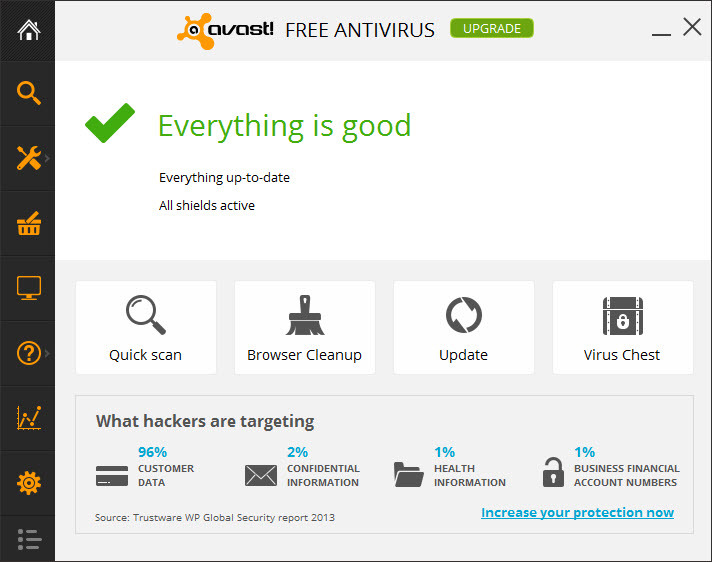 Avast updated there user interface of all there avast antivirus products. It looks like they have designed the product keeping in mind of windows 8 operating system. The design matches very well with the windows 8 OS. If you don’t like some option, then you can remove those during installation itself by choosing Custom installation option. For example, I really don’t like Avast Software Updater which is more annoying option to me. So I removed it during the installation itself. If you don’t like that option or any other option, then you can do the same. One more change which I like in new version is, the shortcut which you can find on Home tab. For the first time user they don’t find much interesting about those icons but the special thing is, you can change which shortcut you need. You can remove those shortcut just by right clicking and choosing Remove shortcut option. To add any new shortcut, click on Add button and choose the option which you need to add. These is really one of the very useful feature which I’m seeing in this version. Because we can place which function we use most, which avoids searching on the application for the function and thus it save some time. Another change in latest version is, Avast deepscreen technology. It is an successor of AutoSandbox. What it actually do is, if any unknown or new file was found then it will be executed with DeepScreen to give extra protection. What I observed is, this performs similar like autosandbox and sometimes it annoys me because it takes some time to scan that software during installation. You can enable or disable this feature by going Settings >> Antivirus >> DeepScreen. Moderate: mode which allows any other files except those with low reputation in avast! file reputation database (e.g. low prevalence files) to run. You can enable or disable this feature by going Settings >> Antivirus >>Hardened mode. Another major feature which we can observe in Avast 2014. With this feature user can scan the PC in boot mode without even installing Avast in that system. So if any of your system is infected with virus, then you can scan that system directly by using rescue disk feature. What all you need is-a pen drive, system with avast 2014 antivirus and an infected system. Just create a rescue disk using pen drive and take that pen drive to scan on non installed PC. You can locate this feature at Tools >> Rescue disk. These are the some major improvements which can be found on Avast 2014 version. All-new web browser plugins featuring comprehensive security ratings, protection against malware, phishing and typosquatting sites and Do-Not-Track (DNT) functionality for improved anonymity on the Internet. Dramatic reduction in product size (full installer < 60MB, compared to old version 120MB) and memory footprint. Continuously streaming update (CSU) technology for up-to-minute detections. Improved cloud scanning features and crowdsourced analysis of suspicious items. I have been using Avast 2014 free antivirus for few days now. It has really improved a lot in terms of performance as well as design. Lot of new features are added and few old feature are improved a lot. If you are still using old version, it is the time to update without even thinking.